Slept in because it is Saturday. That’s not actually true, what I mean is that I woke but didn’t get up. Instead I lay in bed and watched Ireland against Zimbabwe in the World Cup. Eventually I did get up and Mix and I went for a walk, along to the farm cottages at Bogend, then down the road to Fogo Church, through the woods by the side of the Church to the river, across the bridge and up to the road and from there through Caldra Farm to Crunklaw and Nisbet Hill and back home. It was a lovely walk – we saw many very small lambs and almost no traffic but, my goodness, it was windy. 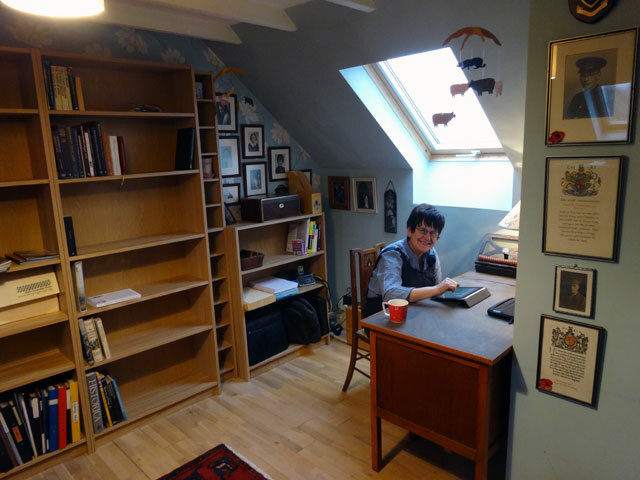 Back home I had one small finger roll with cheese for lunch (was delighted to see that Ireland had won a close fought match) and then tidied in the Bothy while Rachel started removing books to transfer to her new study. Tom popped in to see how the Bothy was standing up to the wind. He declared himself satisfied before setting off to do some more plaster-boarding in his new cottage. David arrived and we went out delivering magazines – it was hard even to stand, the wind was so strong. Back at Mount Pleasant I showed David how I prepared midi files for the organ and then, after David set off for home, Rachel and I joined the family for supper. We then relaxed in front of the fire during the evening, watching a Foyle’s War which I hadn’t seen before. Caught just a bit of the New Zealand against Afghanistan cricket match – New Zealand looked to be on top when I went to bed.